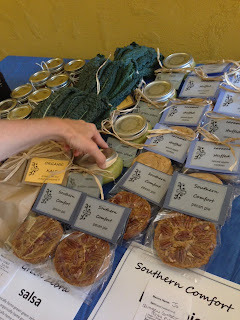 I know we say it every time, but the October Chicago Food Swap was, without a doubt, the best one yet. It was an exciting mix of old friends and giddy first-time swappers. The offerings were, by far, more diverse than we have ever seen. The creativity that is going on behind closed doors in kitchens across Chicago blows me away. It is time to shed some light on the hard work and dedication that Chicago home cooks and gardeners bring to their craft. That is what the Chicago Food Swap is all about. Our host for the event was Pinch Spice Market located right on Milwaukee Ave in Bucktown. Funny story: my husband’s and my first house was right around the corner from this shop. That was the house we lived in from shortly after we were married until right before JR was born. I can assure you that from 2002 to 2006, there was no gourmet spice shop around the corner from our house. But the neighborhood has changed for the better. Pinch Spice Market has a beautiful, open space with rows and rows of tantalizing spices, including some unique proprietary blends. I was inspired to buy some of the Ethiopian Berbere having just read Chef Marcus Samuelsson’s memoir Yes Chef. Owners Mike and Thomas were gracious hosts, even as the swappers soon filled every nook and cranny of the shop with their homemade creations. Yes, this swap was by far the most crowded and chaotic. One first-time swapper described it as “overwhelming.” We had close to 40 people and some of the swappers brought a lot to swap. One development that was exciting was the greater amount and variety of fresh produce available, including fresh eggs from swapper Sarah. I didn’t get any of the eggs, but I was able to swap Sarah for six Green Zebra tomatoes. 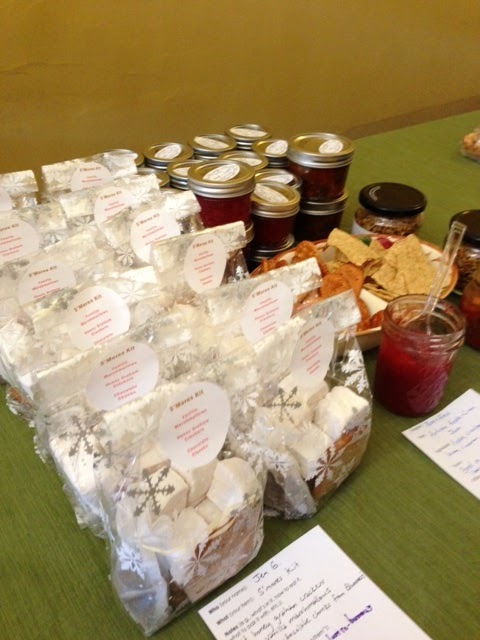 Jim and Cheryl of Ready Jam Farms in Marengo, IL brought some of their homegrown organic produce as well as baked goods and jams. I scored some broccoli, onions, two kinds of hot peppers, and Swiss chard for a bottle of my plum brandy, which Cheryl told me she plans to give to her Hungarian mother. Swapper Jo brought some of her just-picked kale that was packaged in charming brown paper wrappers. I believe I spied some apples and some fresh herbs as well, but the truth is, there was so much going on, I was not able to scope out all of the offerings. In addition to all the beautiful vegetables, there was a tremendous variety of prepared foods. Fall flavors definitely seemed to be a theme, as I saw lots of cranberry and pumpkin goodies. Drink syrups and alcoholic infusions were another popular item. I saw pumpkin vodka, sasparilla, Jamaican sorrel syrup — which was a revelation — and spiced ginger syrup, in addition to my Hungarian plum brandy. As always, there were plenty of food in jars, to borrow a phrase from my friend Marisa McClellan, from jams to flavored mustards to salsas to pickles. I was very excited to go home with some pickled fennel, which I am planning to save for my Thanksgiving relish tray. Sadly, I missed the blueberry aigre-doux, which was also by Erielle. 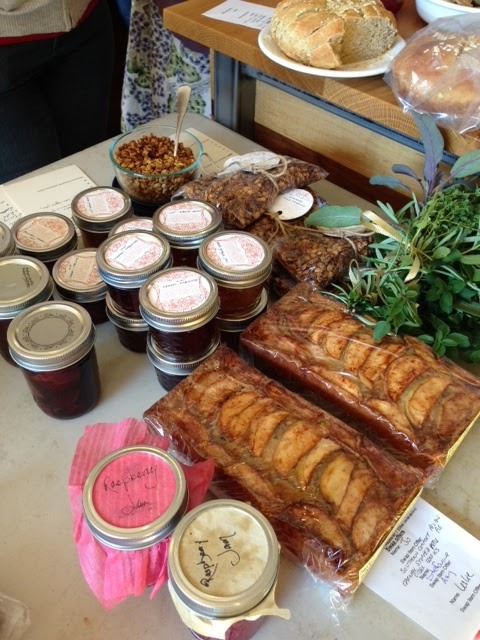 Baked goods are always big at the Chicago food swap and this time was no exception. I couldn’t resist the fragrant savory monkey bread that was on offer. I also saw a gorgeous wheat boule. And naturally, there were plenty of sweet treats. By now my kids expect me to come home from a food swap with something they can eat for dessert that night. Last night, I managed to come home with Michelle‘s S’mores bars and an adorable S’mores-making kit complete with homemade marshmallows and graham crackers. Something that was new this time: dinner food! My co-founder Chef Druck brought homemade soup, including chicken stock and sweet potato bisque. Although we had never actually swapped with each other before, I was very excited to trade her some of my Damson plum paste, which she said her husband would love, for one of the jars of bisque. Reader, I ate it for lunch today with half of the monkey bread. As if that weren’t enough, I traded one of the bottles of plum brandy for a quiche! Yes, a whole spinach-Gruyere quiche with a homemade crust from Erin. Guess what’s for dinner tonight? That’s right, practically my whole food day was courtesy of the Chicago Food Swap. What’s more, I combined the tomatoes and some of the onions and peppers I got at the swap into two jars of spicy salsa. Maybe I will even bring it to swap next time. It’s like a second-generation swap. In truth, the best thing about yesterday’s swap to me was not all the wonderful food but rather the excitement and buzz in the room. We had a large number of first-time swappers and they were all amazed by the crowd and the available goodies. So many of them came up to me to express their joy at having found this group and asking when we could do it again. As Thomas, one of the owners of Pinch Spice Market said to me: we are really onto something here. The demand is already exceeding our capacity to plan these events and to find spaces big enough to hold everyone who wants in. I feel that we are riding a wave that is just beginning to rise. Who knows where it can lead? Chef Druck and I are ambitious thinkers and we have ideas. Ideas like a food swap and potluck at a farm. 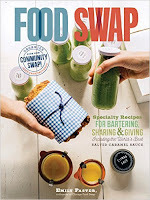 Our swappers have ideas too, like a recipe exchange or maybe even a cookbook. The most important thing to me is that we continue to shine a spotlight on the home cooks and gardeners who dedicate tremendous energy and creativity to their love of food. We want to bring people like that together and to let them inspire one another. Speaking of next time, the December swap will be on Sunday December 2 at 3 pm. Our host will be the Peterson Garden Project, which has an education space at 4642 N. Francisco in Ravenswood Manor. As always, it is free to join in the swapping, but we do ask that you register in advance. Registration has not yet opened for the December swap, but we will open it soon. These swaps fill up notoriously quickly so don’t be left out. Follow us on Facebook or get on our email list by sending your address to chicagofoodswap at gmail dot com. I hope to see many of you there.